The United States Embassy in Nassau, The Bahamas is pleased to announce the winners of the 10th annual Dr. Martin Luther King, Jr. Essay contest. The purpose of the contest is to encourage students to explore the life of Dr. King and his impact on the civil rights movement. The contest attracted participation from high school students throughout New Providence, Grand Bahama and the Family Islands. This year’s theme came from Dr. Martin Luther King, Jr.’s famous speech entitled, I Have a Dream where Dr. King shared his dream of a world where all people lived in peace and harmony. 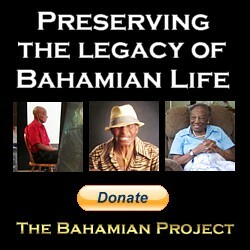 Students nationwide were asked to write an essay about how peace and harmony could be achieved in The Bahamas. This year’s winners illustrated love of country and a desire to see nonviolent social change in their communities. It’s time for us all to stop talking and start doing. We need community centers and strong national mentorship programs supported by the church, government, corporate volunteers and caring neighbors to focus on at-risk children. Many of these children seek love and attention in all the wrong places such as gangs and inappropriate companionship, resulting in them getting involved with crime or sexual relations at a young age. If we all do our part we can change this vicious cycle. Whenever I hear the heartbreaking news of another senseless shooting or armed robbery, I cannot help but wonder why guns are so accessible. This constant supply of dangerous weaponry stands obstinately in the way of our achievement of a peaceful Bahamas. The simple pull of a trigger takes an innocent life. The formation of a police force dedicated to the removal of illegal weaponry and the termination of black market weapons trade is essential. The foundation of any strong society is based upon healthy families and good values. When there is weakness in the family unit, it negatively impacts society at large and as a result at-risk youth are becoming involved in anti-social behavior. Parents should be held accountable for the actions of their children, and enforce discipline when there is a violation of moral and ethical rules in society. 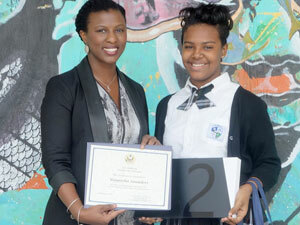 Rhema Nottage, a 12th grade student at St. Andrew’s School received an Honorable Mention. The top winners received a Microsoft Surface tablet, books on the life and legacy of Dr. Martin Luther King, Jr. and EducationUSA college advising materials. Photo 1: U.S. Chargé d’Affaires a.i. Lisa Johnson presents 10th grade student at Queen’s College Jayda Ritchie with her first place prize, a Microsoft Surface tablet. 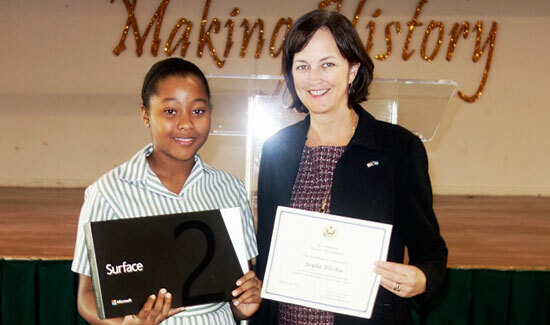 Photo 2: Acting Deputy Chief of Mission Neda Brown presents Tiffany Hanna, 11th grade student at St. Augustine’s College with her first place prize, a Microsoft Surface tablet. 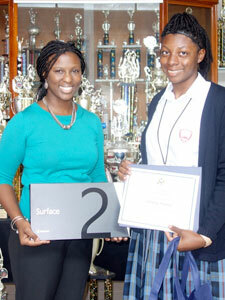 Photo 3: Acting Deputy Chief of Mission Neda Brown presents Waynisha Saunders, 10th grade student at C.V. Bethel High School with her first place prize, a Microsoft Surface tablet.